Once again I am succumbing to the temptation to do an easy post, little more than a copy and paste of something I posted on the earlywritings forum recently. A topic I was addressing had to do with the significance of prophecy, or rather, fulfilled prophecy, in the narrative of our apparently earliest gospel, that according to Mark. Fulfilled prophecy, the original idea went, surely meant that the narrative was deemed literally historical. I took the opportunity at this point to relate how ancient historians of the day were not necessarily considered very reliable or truthful and posted a section of my earlier post, The evidence of ancient historians, in which a Roman philosopher scoffs at historians of his day as nothing more than outright liars. But I followed up with something a bit more substantial, an observation that the motif of fulfilled prophecy was a characteristic of ancient fiction, even historical fictions. The use of prophecy was a stock tool for driving the plot of both fiction and history. Herodotus, the “father of history”, narrated many instances of prophetic utterances of the Delphic oracle and it has been argued that Herodotus’s Histories was as theological in function as the Hebrew Bible’s history books — meant to teach the power of Apollo and need to submit to his will. Homer’s epics are driven by prophetic announcements, too — and Homer was considered to be a “historian” in ancient times. Then there are the clearly fictional novellas (or “historical novels”) whose plots are primarily driven by prophecies. E.g. Xenophon of Ephesus and his Ephesian Tale. After a few paragraphs setting the scene the author begins the story proper with a prophecy that no-one can understand but is only made clear after it is fulfilled. Sound familiar? Perhaps the author was inspired by the Gospel of Mark to write a similar fiction? The temple of Apollo in Colophon is not far away; it is ten miles’ sail from Ephesus. There the messengers from both parties asked the god for a true oracle. They had come with the same question, and the god gave the same oracle in verse to both. It went like this. Why do you long to learn the end of a malady, and its beginning? One disease has both in its grasp, and from that the remedy must be accomplished. When this oracle was brought to Ephesus, their fathers were at once at a loss and had no idea at all what the danger was, and they could not understand the god’s utterance. They did not know what he meant by their illness, the flight, the chains, the tomb, the river, or the help from the goddess. . . . .
Achilles Tatius wrote Leucippe and Clitophon, another fiction, with a similar motif, though the opening prophecy came in the form of a dream. But other more direct prophecies pop up in the course of the narrative and again the hearers are as bewildered as Mark’s disciples about they mean. Send there an offering to Herakles. They were all puzzling over the meaning of the prophecy when . . . .
What follows is an attempt to decipher the “parable” by finding what each detail represented in code. At the end of the story the hero bewails that fact that it seems the god prophesied only something negative, loss and failure … but he is to be proven wrong. It’s a similar motif as we find in the Gospel of Mark when Jesus prophecies his death. Peter protests, but he is over-ruled and eventually learns that it’s all good. Other “novellas” follow the same pattern. Another is The Ethiopian Story by Heliodorus. There is a “historical novel”, a fictional narrative, about Alexander the Great (said to be by a “pseudo-Callisthenes”) that is also prophecy driven. One might even say that the motif of a prophecy-driven plot is a characteristic of fiction, or even fictionalized history. When historians wanted to be taken most seriously they cited their sources or told readers why and how they judged some source more reliable than another. They were not even beyond making up fictional sources — e.g. Herodotus. Or beyond rewriting scenes from plays and presenting them as an eyewitness narrative — e.g. Thucydides. Hence Seneca’s cynicism towards historians as quoted in my earlier comment. Fehling, Detlev. 1989. Herodotus and His Sources: Citation, Invention and Narrative Art. Francis Cairns Publications. Mandell, Sara, and David Noel Freedman. 1993. The Relationship between Herodotus’ History and Primary History. Atlanta, Ga: University of South Florida. Reardon, Bryan P., ed. 1989. 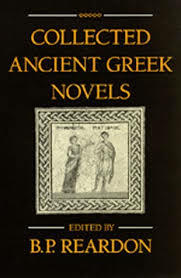 Collected Ancient Greek Novels. Berkeley: University of California Press.